It was enough to grab headlines on numerous music websites and blogs but the collection wasn’t brightly shining or remotely as interesting as the names associated with it. For Jones it was a case of continuing what he does best for the house, exploring sportswear codes and infusing it with traditional tailoring and workwear principles. 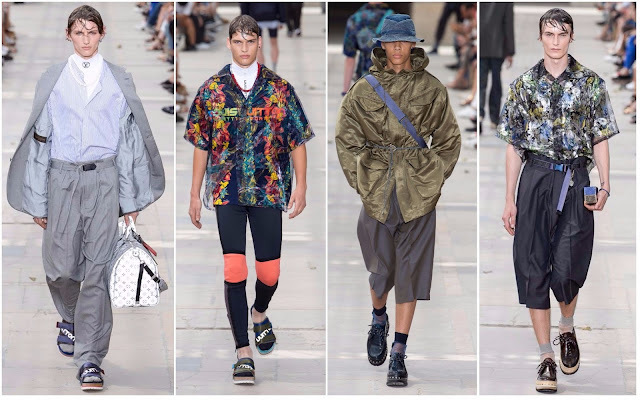 Louis Vuitton is primarily an accessories company and there were plenty of bags and trainers to satisfy commercial requirements but there weren’t many memorable moments of the sartorial kind. The most exciting was the reemergence of the Hawaiian shirt. A brightly-coloured tropical print with the label’s logo was a standout. Perhaps it’s the cult around Nicolas Ghesquière and his glory days at Balenciaga that make the womenswear shows more slavishly enjoyed but there is a fervent support system backing Jones. The British press will not only attest to his gentle, kind personality but to his clothing, wholeheartedly. His fluid tailoring is relatively different to most of what is presented on the runways these days but the looser silhouette often swamps the wearer, in unfashionable ways. His strong points are his use of fabric—neoprene joggers, for example, in varying shades of blue and leather trousers were remarkable, but couldn’t support the entire collection. Jones is an expert merchandiser. His collaboration with Supreme merely confirmed the fact. This season’s key pieces were the Hawaiian shirts that will be everywhere next season, the neoprene sportswear and Safari-inspired jackets. He manages to innovate at Vuitton, occasionally exercising a powerful tailoring muscle but somehow it manages to fall flat. The proof is in the drab styling.